We booked our tickets, this time Vaishnodevi had to happen. If you are off to Katra from Mumbai, the best option is Swaraj Express (BDTS to SVDK – train # 12471). We left on 24th March 2016, 07:55 hrs and reached Jammu on 25th March 2016, 15:55 hrs. Although our booking was up to Katra (station is very near to the SVDK base) we got down at Jammu which is at a distance of 50 km from Katra and stayed there during our trip. We took rest for around two hours and then left for Vaishnodevi at 17:30 hrs. 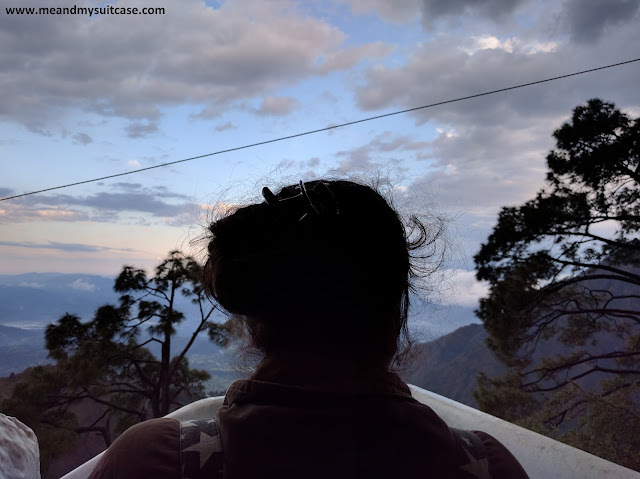 The one hour drive to Katra was beautiful and without any hindrance. Broad roads, the smooth Jammu Udhampur Highway, breezy evening, everything added to a happy ride. 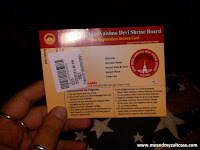 We reached Katra around 18:30 hrs and got our Yatra Registration Access Card, which is a must. You got to carry your Id proof along and that’s it. The registration is free of cost. The Trikuta mountain where the shrine is located and the holy cave are the gateway to the holiness. Trikuta mountain is named so as it has 3 peaks. We started ascending towards the shrine at 19:15 hrs and reached by 02:00 hrs the next day. 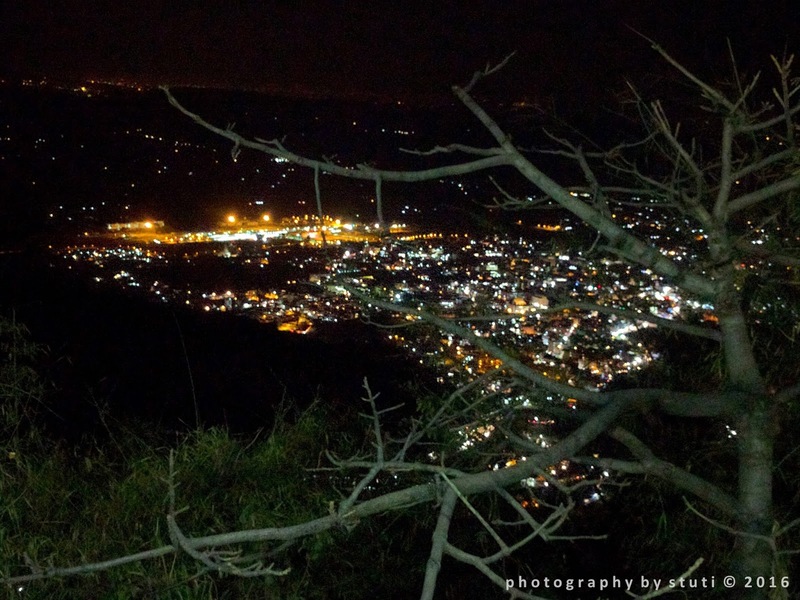 The road to shrine is well paved and you can witness from top Katra city glittering in light. The way to shrine is open 24 hrs, covered with shade for most of the way and is fully lighted. There are many stalls, shops, even CCD and seating areas which you will find on the way. Journey will be comfortable if you have the will to walk. 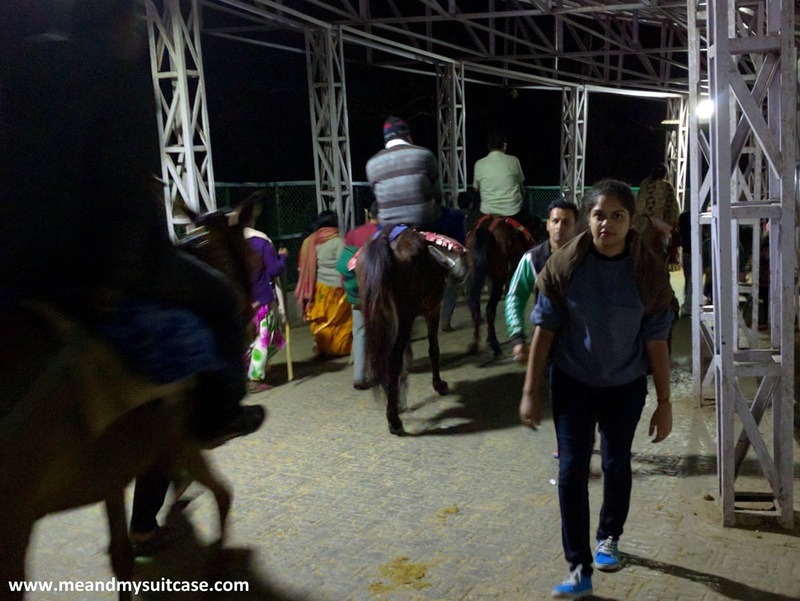 But if you get tired, you can hire mule and also there is the option of palki (to check charges, click here). There are also some people available on the way who will massage your feet if you please so (on charge). Don’t carry too much stuff viz. food, blankets etc. you can get on the way too. There is one more simple and stress free option to reach Vaishnodevi and that’s by helicopter for which you have to do the booking 60 days in advance online. For more info you can visit Shri Mata Vaishnodevi shrine board website. 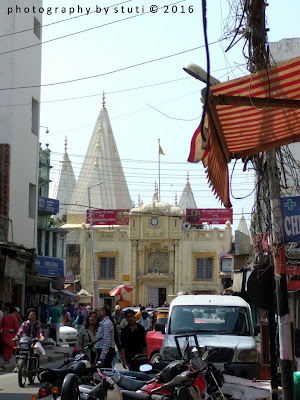 There are many landmarks on the way and the places of importance like Ardhkunwari temple, Banganga, Himkoti etc. Ardhkunwari is around 6 km from the base. As we reached there, we saw many people were already lined up for darshan and some people were even sleeping in the area in front of the temple with the blankets and everything for their turn. We skipped that for the lack of time and continued towards the main temple which was another 8 kms from Ardhkunwari. It is important to note that everywhere it’s written that the shrine is 12 km from the base and some say it is 13 km but believe me it’s more than 13 km. Also after a few km I saw the same sign of how many km are left, repeating. We reached the shrine and then the tough time began. We went around Holi thinking being a Hindu festival it won’t be much crowded but against our assumption the line was too long. To add there was so much chaos. 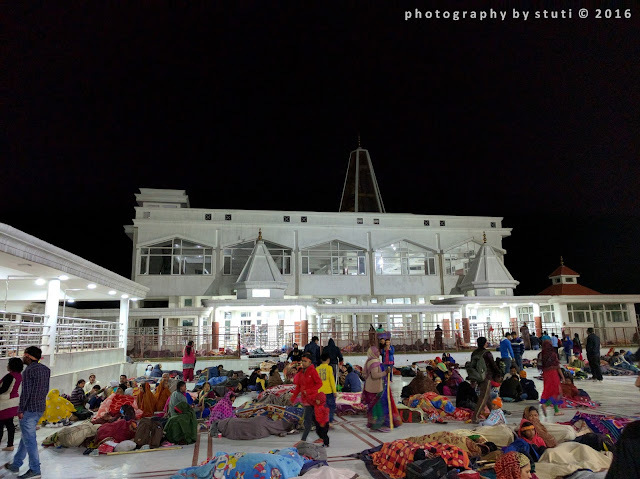 I had heard that the facilities at Vaishnodevi are too good, with cloak room, dormitories, veg restaurants, volunteers present every time and every where but what I experienced was totally opposite; the crowd was going berserk, were clueless. But by mata’s grace we came over all the hurdles and got darshan by 05:00 hrs. We were tired, we were hungry but with darshan everything felt okay. There were some things which were not right; quite surprisingly the behaviour of the committee, needless to say they were not expecting so much crowd that day and were not able to handle. Still I feel they should have been prepared. It was cold up on hill and was raining. As we left thunderstorm too started, light went out and for around 5 minutes every one felt helpless without current. One wrong move could have resulted into stampede. Nonetheless, the darshan were quite brief. A few seconds were given to witness pindis in the inner sanctum. 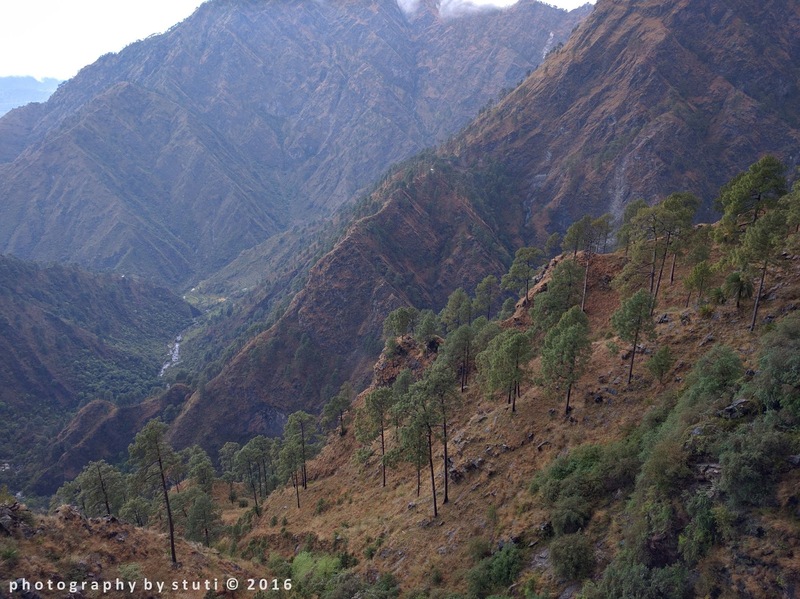 There are 3 pindis (natural formation rocks) which symbolizes Mata Vaishnodevi. The right one is Mata Kali, in the centre Mata Lakshmi and the one in left is Mata Saraswati. We gave Baba Bhairavnath also a miss. It was not advisable to visit during dark and with that thunderstorm. 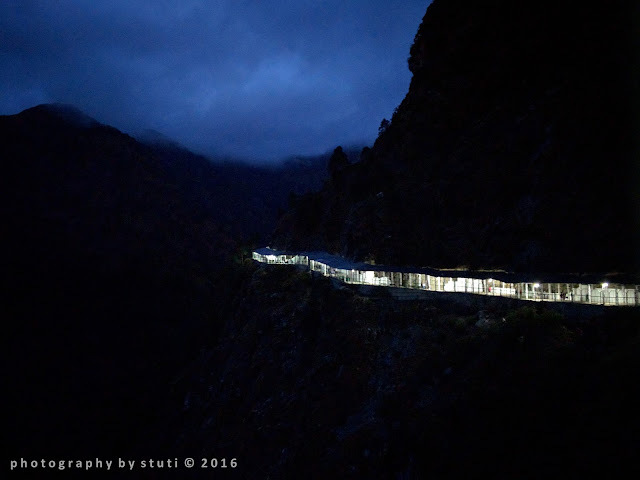 Although, its been said that darshan of Vaishnodevi is considered complete when one visits Bhairavnath too. But we had made a hard choice. We started descending mountain around 05:30 hrs. Its really surprising, also commendable that despite such a hard, strenuous journey, Vaishnodevi which is at an altitude of 5200 feet invites over a crore people in an year and 30,000 – 50,000 everyday, more so in peak season. On our return journey we were blessed to witness beautiful landscape. As the light broke, birds started chirping, monkeys jumping from here and there made for our sight. But beware, stay away from monkeys, also don’t offer them anything to eat. We reached at the base by 13:00. Initially we thought that the walk down towards base will be easy but that was no easy walk. Our legs were aching beyond pain, not able to move any further but we managed to reach our car. Once in the car, at least I don’t know when we reached the guest house. I was asleep. We had other plans in the itinerary but we chose to sleep and good we did. I suggest that if you plan to walk up to Mata Vaishnodevi, the next day you ought to take full rest. Its located on the banks of River Tawi. 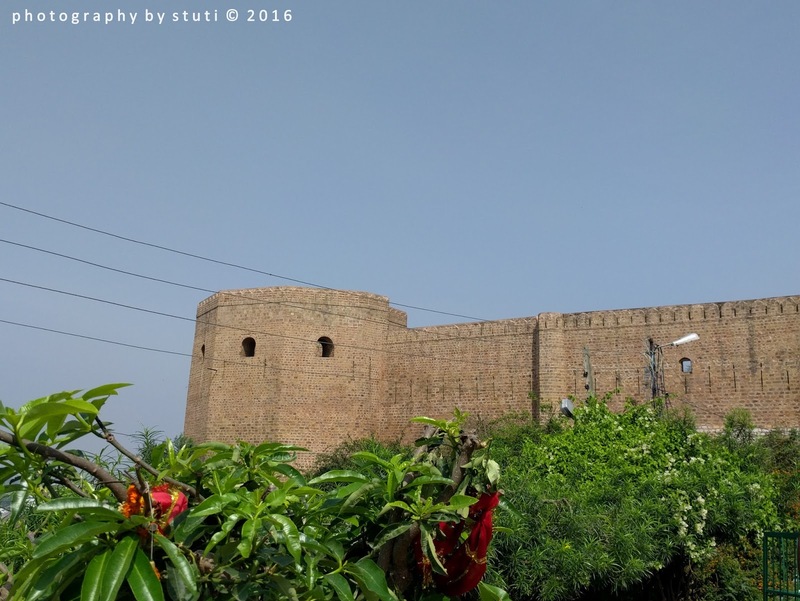 Once a fort, constructed by Raja Bahulochan over 3,000 years ago it now houses Bae wali Kali temple. Although it’s a fort, photography ain’t allowed inside. The temple is small, line grows big so takes time to get darshan. Built in 19th century by a French Architect for Raja Amar Singh is now been converted in to a Museum. Overlooking River Tawi at the back this red coloured palace which is built in red sandstone with red bricks has not only beautiful paintings and artifacts but also well maintained gardens in the complex. The museum also organizes heritage walks around the complex to give detailed insights into the history of Jammu and surrounding cities. The best part of the museum is the golden throne of Jammu, weighing a whopping 120 kg, all pure gold. Timings: Apr to Sep - 09:00 to 13:00 hrs, 14:00 to 18:00 hrs; Oct to Mar - 09:00 to 13:00 hrs, 14:00 to 17:00 hrs. Closed on Monday and National holidays. Ticket price: Adult - Rs.20, Child (3 to 10 yrs) - Rs.10, Special ticket - Rs.100, Camera - Rs.50, Video Camera - Rs.200. 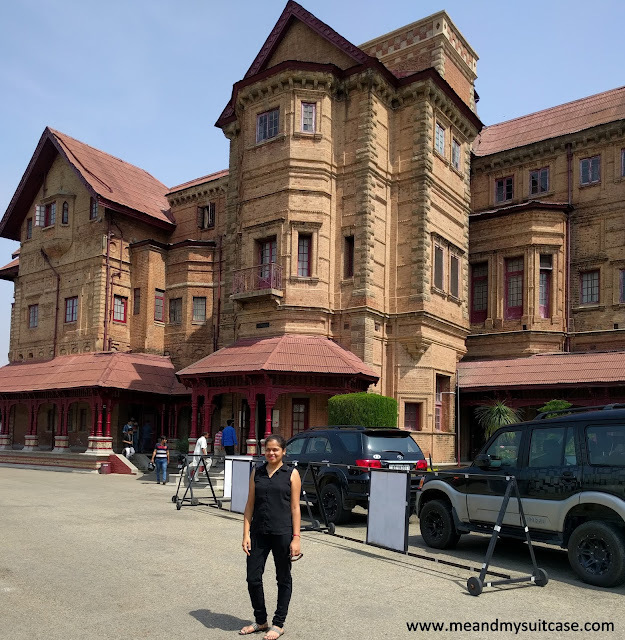 Post clicking and exploring Amar Mahal Palace we visited one of the oldest and largest temple complex, the Raghunath temple. The complex houses seven Hindu shrines, each with its own Shikhara. The temple was built during the period 1822–1860 by order of Maharaja Ranjit Singh. The temple has many gods in its complex of shrines, but the presiding deity is Rama, an Avatar of Vishnu. The Mughal architectural influence is seen in all the spiral shaped towers which have gold plated spires, except the tower over the main shrine which is said to be in Sikh architectural style. The niches in the walls of the shrines are decorated with 300 well crafted images of deities. The paintings in the 15 panels of the main shrine are based on themes from Ramayana, Mahabharata, and Bhagavad Gita. The temple was also in the news during 2002 when suicide bombers Fidayeen of the Lashkar-e-Toiba attacked it twice with grenades and indulged in indiscriminate firing which resulted in death of many devotees and also in injuries to many people. Photography is not allowed. Entry is free. With that we ended our Jammu tour but not before shopping in Raghunath Bazaar. We bought walnuts, clothes (go for kashmiri work), sweets and few souvenirs. 1. Carry some warm clothes, you may be surprised by the temp drop up there and the difference it has with the temp down at Katra. 3. Wear comfortable shoes during the climb. 4. The walk can be done throughout the year although but the peak season is during the summer (May-June), the New Year and the Navratra months in March-April and September-October. 5. Avoid the walk in the monsoon (late July to early September) when the road becomes slippery and the route is very cold in December and January, so plan well. 6. Helicopter ride is around Rs.1200 per person, one way and it drops around 2.5 km from the main shrine at helipad Sanjichhat. Helicopter journey is around 8 to 10 min. 7. Many stay options available from Budget to Luxury in Jammu, Katra and even dormitories can be rented which is made available via shine board. Apart from what I have mentioned above you can also visit Ranbireshwar temple, Mubarak Mandi palace, Mahamaya temple to name a few. You need not pay at every shine in Raghunath Temple if you don't wish to, you may find some situations there but try and avoid. 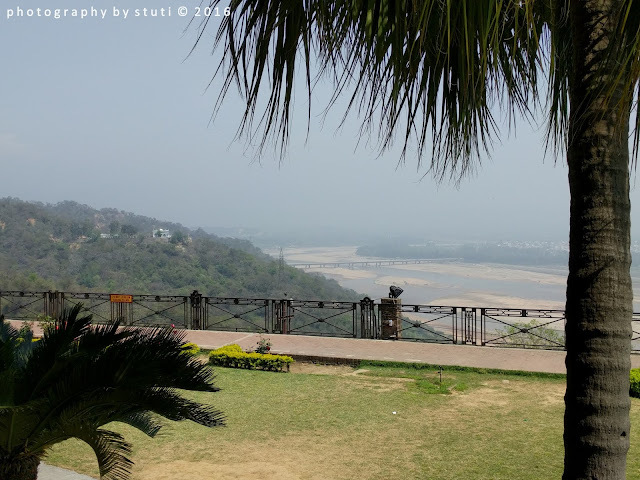 If you have some time or an extra day, you can visit Patni top and the ancient Martand Temple (Sun Temple) which are like getaways from Jammu. 1. Day 1: Reach Jammu / Katra by afternoon. 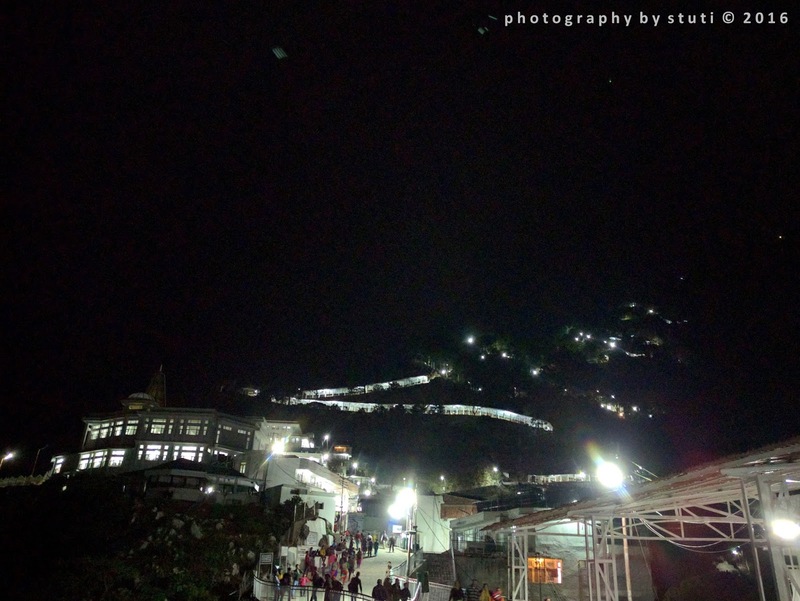 After a brief rest leave for Shri Vaishnodevi Katra if you intend to travel on foot. 2. Day 2: Come back to your hotel. Rest (recommended). In case you are okay after rest of few hours, you can visit local market in eve. 3. Day 3: Early morning leave for Patni top for a day’s picnic or for half day as per your choice. Remaining half, visit Martand Temple. 4. 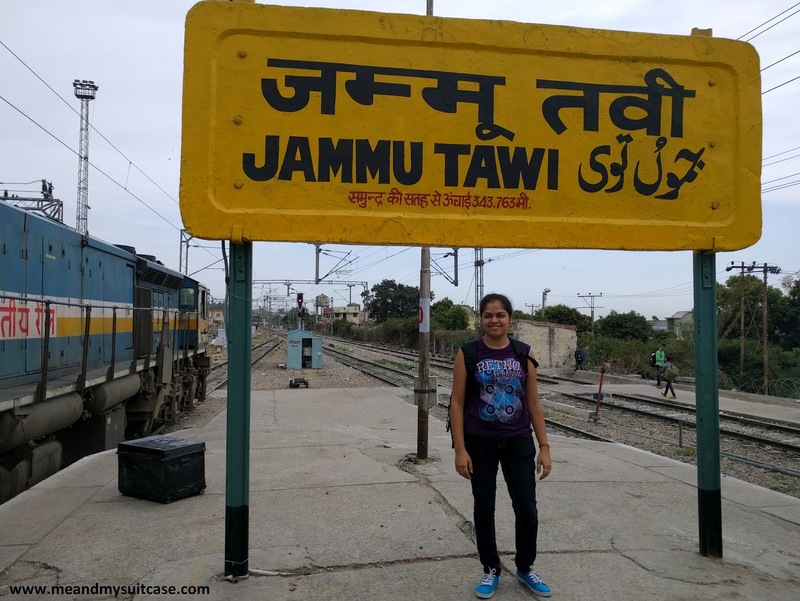 Day 4: Do a day tour of Jammu plus the shopping. Leave in Eve / Night. In case you wanna extend, Go Kashmir, add another 4 - 5 days. P.S. If you wanna take helicopter, better leave in the morning for the shrine. You can complete darshan in half a day. Have a safe and good trip. Jai Mata Di!